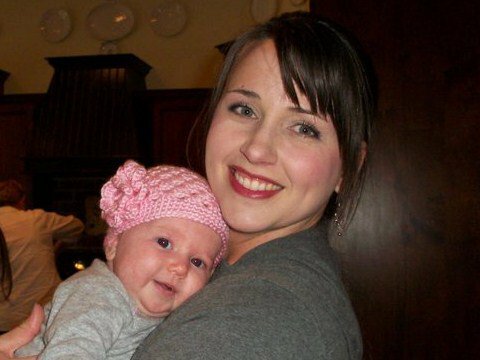 She calls me "Mama Leisha": Guest Post: SPIDERS! It's been a looooong time since my sweet and sassy friend, Sunshine, guest posted. Too long, if you ask me! Well...never fear, another "Sunny Sunday" is here! ENJOY! The Icky, Icky Spider Crawls Up the Water Spout...BLAM! Got Him! A few things you should know about me: I've jumped out of a moving airplane at 10,000 feet. I can deadlift 200 pounds. I can do real push ups. I've run a marathon...in the rain, in a forest, by myself. I can handle my husband's Walther P22 hand gun with a reasonable amount of confidence. There are very few things that intimidate or scare me with one BIG exception...spiders. 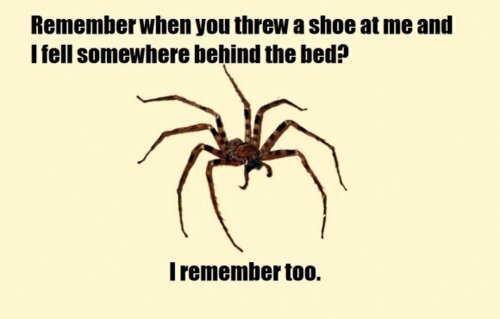 Now that you know how I feel about spiders, let me share a little story. All this cold weather we've been having has meant a higher-than-usual number of creepy crawlies making their way indoors, which means my nerves are shot. So, I'm walking by the front door and notice the biggest, meanest, hairiest, blackest, jumpenest, spider you've ever seen. He's hanging out on the door frame, smoking a cigarette and sharpening his switch blade. Okay, that last part might be a SLIGHT exaggeration, but you get the idea. My heart starts pounding and I steel myself for the task of disposing of this thug, who's tattoo is COMPLETELY misspelled by the way. I'm trying to stay calm, but I keep making these squealing sounds--followed by muttering and pacing--all of which draws the twins right into the drama. As they approach I tell them, "Stay back you guys! There's a spider and we're all going to just stay calm, okay? Nobody panic." The two of them just stand there looking at me like I have lost my mind. "I'm serious, nobody panic." I get the fly swatter, grumble something about not having any stiff alcohol in the house, and approach the tarantula terror that keeps moving ever so slightly just to freak me out. After a couple of pep-talk like statements, including, "I got this, no worries, you can do this!," I take the plunge. I swat that spider with all the might and fury of a woman protecting her young (who, by the way, are terribly entertained and still looking at me like I am a few tacos short of a combo platter). No, I didn't miss! But once I smacked it, it went MIA. Now, if you think finding a brown-recluse-science-experiment-gone-bad on your door frame is scary, try picturing not knowing where said death angel is and then weigh that with the idea that you may very well have just smacked it right onto your shirt front. I scan the twins (still staying a safe distance per my constant threats). Nope, they're clean. I start at my head and do a swiping, dancing, shimming, hopping, twitching move all while shouting, "WE ARE STILL NOT GOING TO PANIC." (You have to say it with a hysterical rise in your voice, on the last word, to really get the effect.) After what felt like roughly 45 to 50 minutes, I locate the dead beast with his guts spilled all over the black gym bag he landed on and then blended in with. If I didn't think it would give me nightmares for life, I would have that sucker mounted on my wall. The moral here: I don't like spiders. The other more meaningful moral here: How many other little/silly things am I afraid of, that are holding me back? Armed with a fly-swatter and some serious courage, I'm pretty sure I could conquer the world. I am right there with you on the hatred of spiders! We just bought a house and it was filled with all kinds of nasty eight legged creatures! Thank you Orkin is all I have to say! Following you with Super Stalker Sunday! LOL! This post is hysterical but not really for you I'm sure. I can totally relate. I had a very terrifying encounter with a wolf spider carrying its 900 babies on its back. I still have nightmares..ick!!! New follower from SSS Hop. What is it about these creatures that make us freak everytime we see one? BAHAHAHAHAHAHAHHAHAHAHAHAHAHAHHAHA! Oh my GOODNESS!!!!! It's like you reached into my brain and yanked out exactly how I feel ab those furry creatures from hell!!! Eww! I HATE them!!! Its that time of year where the big, great-great Grandpappy spiders come out on my porch. I have shot at them with my son's Nerf gun, sprayed them with hair spray, considered buying a special Spidey shot gun....ick!!!!! They terrify me! Thank GOD you found that sucker!!! My gosh!!!! Don't you love when people say "oh, they don't bother me...they eat other bugs and keep them away". What-EVER!!!!!!! Aleisha, oh my gosh you crack me up! what a beautiful family you have :-) By the way, I am your new GFC(wifetoalineman02) followere here. Dropping some love for Friendly Friday Blog Hop, hope that you can return the favor too. Oh I absolutely hate spiders too! I make my hubby spray every 3 months! I am looking for bloggers to participate in 25 Day's of Christmas Blogshare...check out the post and leave a comment if you are interested in participating! hilarious and wonderful post, sunshine!! you paint such a picture, just like your awesome friend, aleisha!! i love this! hahahaha has me cracking up. 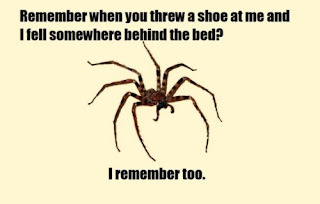 brings back many memories of my encounters with spiders. ughhhhh i can't stand them either. they give me the heeeebieee jeeeebies! on a few occasions, i've actually slept in other rooms...if not able to catch them.